The HVAC equipment manufacturing industry include companies offering manufacturing ventilating, heating, air-conditioning, and commercial and industrial refrigeration and freezer equipment. HVAC system consist of interconnected mechanical systems that provide thermal comfort and air quality in an indoor facility. The top five companies covered are United Technologies Corporation, Daikin Industries Ltd, Johnson Controls, Inc., Ingersoll-Rand PLC and Bosch Group. United Technologies Corporation was the largest company in the market. The global ventilation, heating, air-conditioning, and commercial refrigeration equipment manufacturing market was valued at around $288 billion in 2017. Western Europe was the largest region in the ventilation, heating, air-conditioning, and commercial refrigeration equipment manufacturing market in 2017, accounting for around 36% market share. USA was the largest country in the market in 2017, accounting for around 16% market share. The HVAC companies are increasingly integrating IoT technology with HVAC equipment due to growing demand for real time insights from HVAC equipment. The internet of things is the inter-networking of physical devices embedded with software, sensors and network connectivity which enable these objects to collect and exchange data. Using IoT, HVAC systems are closely monitored and controlled from remote locations. 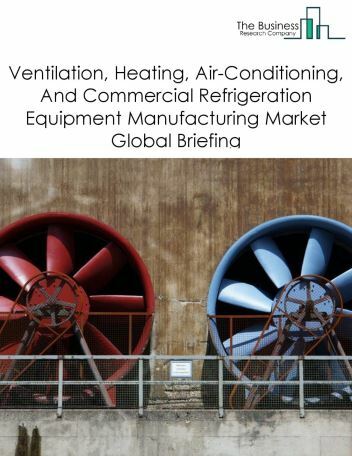 The ventilation, heating, air-conditioning, and commercial refrigeration equipment manufacturing market is segmented into industrial and commercial fan and blower and air purification equipment manufacturing; heating equipment (except warm air furnaces) manufacturing; and air-conditioning and warm air heating equipment and commercial and industrial refrigeration equipment manufacturing. Industrial and commercial fan and blower and air purification equipment manufacturing includes establishments manufacturing stationary air purification equipment, electrostatic precipitation equipment, warm air furnace filters, air washers, other dust collection equipment, manufacturing attic fans and industrial and commercial fans and blowers. Heating equipment (except warm air furnaces) manufacturing comprises establishments mainly involved in manufacturing heating equipment (except electric and warm air furnaces), such as heating boilers, heating stoves, floor and wall furnaces, and wall and baseboard heating units. Air-conditioning and warm air heating equipment and commercial and industrial refrigeration equipment manufacturing includes companies manufacturing air-conditioning (except motor vehicle) and warm air furnace equipment manufacturing and commercial and industrial refrigeration and freezer equipment. 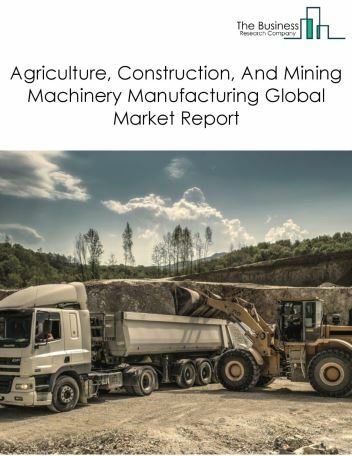 The agriculture, construction, and mining machinery manufacturing market consists of sales of farm machinery and equipment, power mowing equipment, and other powered home lawn and garden equipment; construction machinery, surface mining machinery, and logging equipment; and oil and gas field and underground mining machinery and equipment.by entities (organizations, sole traders or partnerships) that produce agriculture, construction, and mining machinery. 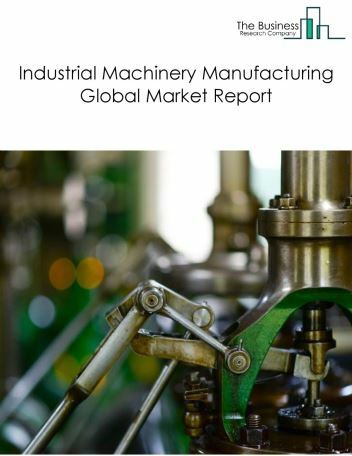 The industrial machinery manufacturing market consists of sales of industrial machinery such as food and beverage manufacturing machinery, semiconductor manufacturing machinery, sawmill and woodworking machinery (except handheld), machinery for making paper and paper products, printing and binding machinery and equipment, textile making machinery, and machinery for making plastics and rubber products.by entities (organizations, sole traders or partnerships) that produce industrial machinery. 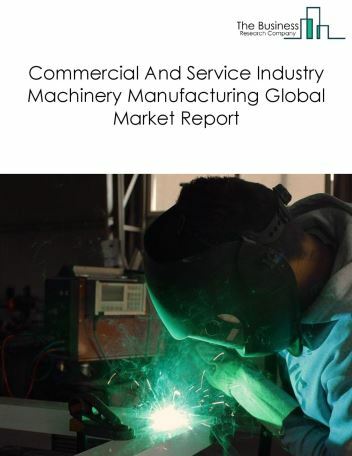 The commercial and service industry machinery manufacturing market consists of sales of commercial and service industry machinery by entities (organizations, sole traders and partnerships) that produce commercial and service industry machinery such as optical instruments, photographic and photocopying equipment, automatic vending machinery, commercial laundry and dry-cleaning machinery, office machinery, automotive maintenance equipment (except mechanics' hand tools), and commercial-type cooking equipment. 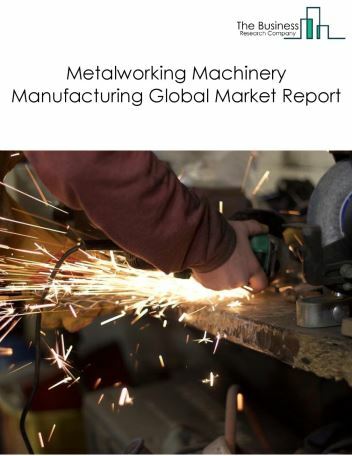 The metal working machinery market consists of sales of metal working machinery by entities (organizations, sole traders and partnerships) that produce machines such as cutting tools, metal cutting and metal forming machine tools, metalworking machinery accessories, rolling mill machinery, assembly machinery, fabricating machines, industrial molds, conversion or straightening equipment, special dies, tools, jigs, and fixtures. 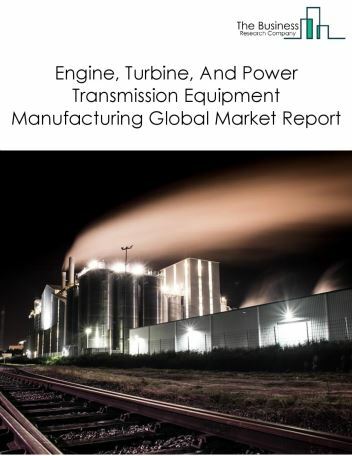 The engine, turbine, and power transmission equipment manufacturing market consists of sales of turbines, power transmission equipment, and internal combustion engines (except automotive gasoline and aircraft).by entities (organizations, sole traders or partnerships) that produce engine, turbine, and power transmission equipment, including clutches and brakes (except electromagnetic industrial controls, and motor vehicle), diesel and semi diesel engines, electric outboard motors, internal combustion engines for hybrid drive systems (except automotive), plain bearings and bushings (except internal combustion engine), power transmission pulleys, speed changers, speed reducers, turbine generator set units, universal joints (except aircraft, and motor vehicle). 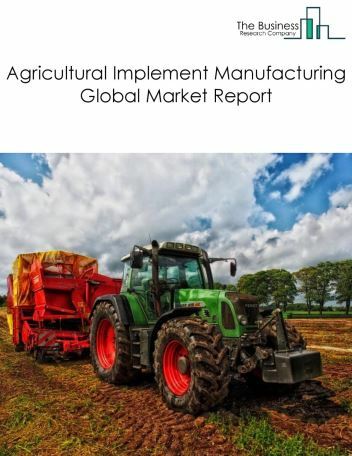 The agricultural implement manufacturing market consists of sales of farm machinery and equipment, and lawn and garden tractor and home lawn and garden equipment by entities (organizations, sole traders or partnerships) that produce agricultural implements, including combines, cotton ginning machinery, fertilizing machinery (farm-type), haying machines, milking machines, planting machines (farm -ype) poultry brooders, feeders and waterers, power lawnmowers, snowblower and throwers (residential-type) tractors and attachments (lawn and garden-type and farm-type). 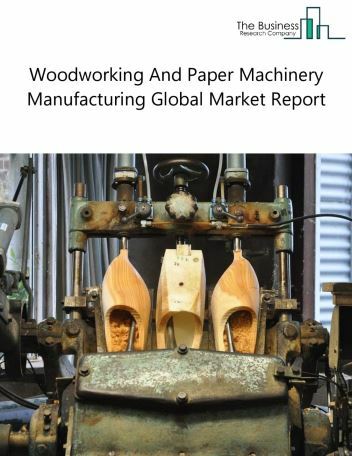 The woodworking and paper machinery manufacturing market consists of sales of woodworking and paper machinery by entities (organizations, sole traders or partnerships) that produce sawmill and woodworking machinery (except handheld), such as circular and band sawing equipment, planing machinery, and sanding machinery, and/or manufacturing paper industry machinery for making paper and paper products, such as pulp making machinery, paper and paperboard making machinery, and paper and paperboard converting machinery. 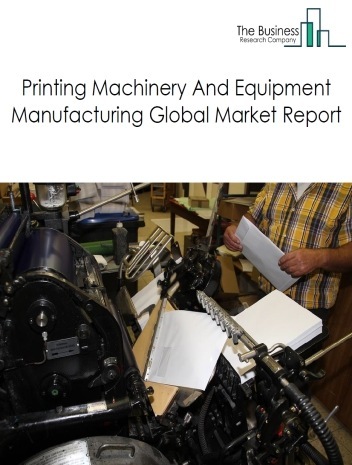 The printing machinery and equipment manufacturing market consists of sales of printing machinery and equipment by entities (organizations, sole traders or partnerships) that produce printing and bookbinding machinery and equipment, such as printing presses, typesetting machinery, and bindery machinery.